Proper care during the bulldozer loading process is crucial whether the device is transported for shorter or longer distances. Here are some of the necessary procedures on how to load a bulldozer and to enhance safer transportation. Selecting the right transportation tool should be the first consideration when shipping a bulldozer. The vehicle should have adequate space and capacity to accommodate the size and the weight of the bulldozer plus all its attachments. If you are transporting large bulldozers, you will require RGN trailers to facilitate safe transportation. For smaller bulldozers you do not need to go for larger trailers, you only need hotshot trailers or the step deck trailers. Depending on the device you want to transport, it is essential to seek some advisory services from your transport agent so that you are advised on the right vehicle for your specific transport needs. Ensure that the vehicle & trailer is parked firmly on the ground. Make sure that the ramp design of the transporting vehicle is suitable to accommodate the weight and size of your bulldozer. If you find it necessary add some blocking under the ramp to enhance more support. Ensure that the ramp and the equipment are free of grease, debris, and mud to avoid any case of sliding and that can cause damage to the bulldozer. The most massive part of the bulldozer should be loaded first, meaning the bulldozer should be reversed onto the trailer. You should run the engine of the bulldozer at the lowest speed possible. This low speed will ensure the bulldozer makes way into the trailer without causing any damage and reducing chances of any avoidable accidents. Ensure that the weight of the bulldozer is distributed evenly on the transporting vehicle. This even weight distribution will ensure that there is no unnecessary pull and tire during the transportation process. Checking the suspension of the vehicle and trailer will be the best way to confirm whether the device is balanced or not. Bring down or lower the bulldozer attachment to the floor of the vehicle, stop the engine and switch the battery off. Before the transportation process starts, you must ensure that all the doors, the covers, and all the articulation points on the bulldozer have articulated lock frame to avoid any possible articulation during transit. Place chocks, cradles, wedges and other means in from off and behind.Each wheel or track to prevent any shifting or rolling of the bulldozer during transportation. Place all tie downs in front and rear tie down positions. Always ensure the use of recommended securement and connection points to maximize effectiveness and minimize damage during transportation. Inspect tie-down equipment and tie-down points used to secure the device. Make sure all connection points and pins are secure, and the hooks are functional. Verify the bulldozer,s tire pressure before loading to avoid loosening of tie-downs, Refer to the owner’s manual for proper tire pounds of pressure. During the loading and the transportation process, it is vital to ensure that the bulldozer’s attachments are secured efficiently. The attachments can be secured together with the bulldozer, or else secured separately in the same trailer transporting the bulldozer. The accessories and the attachments are secured safely using chains to ensure safe transportation. If the bulldozer is equipped with, hydraulic attachments make sure the hoses orientation does not interfere with the machine on the trailer. All hoses should be placed underneath the device connected in such a way that they could easily be disengaged. Also, ensure that you secure all the hoses in line with the owner’s manual before you start the transportation process. 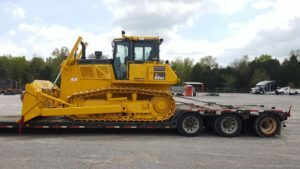 If all the necessary guidelines are observed during the loading and the transportation process, bulldozer transportation is not a hectic process. 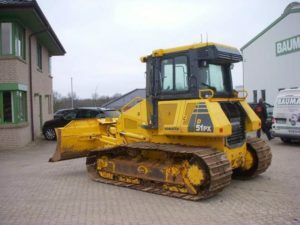 You need to ensure that all the required procedures are followed and you can be sure that the loading and transportation process of your bulldozer will be safe and secure.